Michelle Simone’s Entertaining at Home, a TV show which aired on The Lifestyle Network in the Philippines from 2006 to 2008, launched its own product line, the Michelle Simone Home Office Collection. Working alongside the Product Manager, we developed an entire line of stationery comprising folders, binders, envelopes, clipboards, notebooks, notepads, pouches, storage boxes and cans, and a planner. My role included pattern design (dots, lines, floral), all graphic design, and preparing die-cut specification guides for the printers. The products were sold in mall kiosks and major bookstores across Metro Manila. The Affirmation Folder was a hardbound folder with a plastic sleeve, binder clip, and a slot for more storage. It included planning sheets and pads for notes and lists. The floral pattern line included binders, notebooks, clipboards, and storage cans. It came in turquoise and pink. 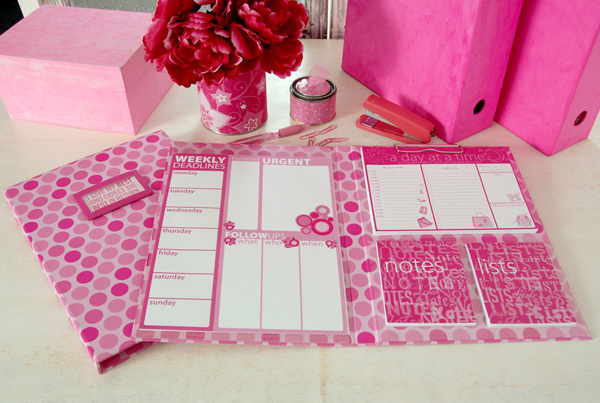 The polka dot line included the affirmation folder (see first photo above), document folders, envelopes, wrapping papers, and storage cans. It came in pink and blue & green variations. All patterns and paper products (excluding the planners featured in this photo) were designed by me.